Forgive my long absence from this poor, neglected blog! I try to only update it when I have some publishing news. But I’m falling down even in that aspect! If you want more frequent updates on my life and projects in progress, hop on over to my LJ. As a child Brenna had desperately wanted a brother. She would try to adopt the neighborhood boys into her family. She would try to walk away with babies at the mall. Other girls her age had crushes and pretend boyfriends. Brenna had pretend big brothers. When she was nine Brenna’s mother told her that she was a twin. She had had a brother in the womb with her and on the ultrasound pictures she seemed to be hugging him. But in the eighth month only one of their hearts was beating. They were delivered by emergency C-section. Brenna held on to her brother until the end–he was born first, though born dead. Her parents had named him Benjamin. 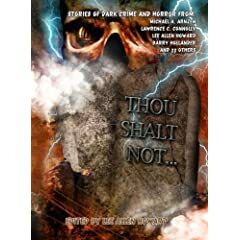 When she was twelve, her mother finally took her to see his grave. Beloved Son and Brother. After that, the thought of a brother only made her incredibly sad. She no longer wished for one. She pushed it out of her mind and forgot about it entirely. Until now. 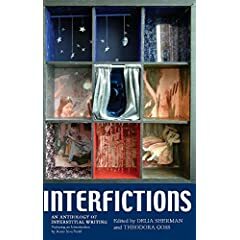 There will also be some interesting discussion of Interstitial and just what that means on the Interfictions blog. People keep asking me what makes Black Feather interstitial. My first impulse is to answer: I don’t know. Then again, this is the story I chose to submit, so I must have felt it was in some way interstitial. For my part, this story is one I used to describe as being magical realism because the speculative parts are taken pretty much in stride and given credibility by the main characters. At other times I’ve also described the story as Fabulist. In the end, I sent this story in because it’s not exclusively fantasy, not exclusively a fairy tale retelling, and not exclusively a story about the 12 ravens that used to show up every time I went into that particular park. When I recieved by acceptance letter, editor Dora Goss said: The way it combines the personal and the fairytale, along with some experimental writing, is just fabulous, and very interstitial. Seems like as good an explanation as any. Clia stood before the large, oval mirror in her room and stared at the reflection. Bone-straight hair?long, shiny and black?a heart-shaped face, perfect button nose, sensual mouth, and wide green eyes. The skin held no blemish and no imperfection?not too dark, but not too light. An elegant neck; firm, round breasts; smooth, flat stomach; curvy hips; long, muscular legs tapering toward the floor and ending at the bottom of the mirror. “Yes, this is what I want,” Clia said. Her mouth moved. The reflection’s did not. Are you ready to gather what I need? I have nothing but time. The reflection shimmered away, replaced by an image of what Clia looked like in every other mirror. She did not often look at mirrors. I’ll be reading with other Interfictions authors at WisCon in May of this year.On June 20th we’re reading for the KGB Fantastic Fiction series in New York City.There will probably be more readings and events this summer. I will do my absolute best to keep you all updated on them!